Join us for our monthly Janna Dyer clinics at Moore Hebert Dressage. Janna is a U.S. Dressage Federation Gold Medalist who has studied with Georg Heyser, Jessica Ransehausen and Robert Dover. She received a USET/Asmis grant to study at Dr. Reiner Klimke's stable with her horse. Having competed heavily and successfully on several different horses at CDI-W's at all FEI levels. Since returning from Germany, Janna has trained with her business partner and participated in clinics with Olympic Judges Stephen Clarke and Linda Zang as well as Chief rider of the Spanish Riding School Arthur Kottas. Her record includes many prestigious wins. Janna is an experienced and positive instructor, who enjoys teaching at all levels. Visit darkhorsedressage.com for more information. Coggins are required before horse is unloaded at the farm. Refunds for riders available within one week of the clinic. Within one week, credit for a future lesson will be given. 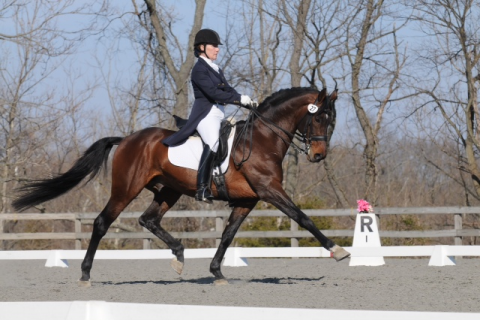 Up to a 45-minute, private dressage lesson with Janna to coordinate with your show ride time(s).